The Ortlieb Back Roller City is all about flexibility giving you the option to use it on both sides of your Front or Rear rack or just as a single pannier. The Incandescent 3M Scotchlite material reflectors are placed on the sides of the bag so you will be highly visible and increase your safety on the road. The Back Roller City is also waterproof and is easy to clean. You can add the Ortlieb Carrying System for those trips or the, Small outer pocket/s for tools, or cash and mesh pocket for wet gym clothes, Shoes or a helmet. These bags offer a carrying handles for easy and convenient mounting and dismounting as well as D-rings for an optional Padded Shoulder Strap (not included) so you can sling the bag over your shoulder when off the bike. If you prefer more loading capacity, couple these Back panniers with the Front Roller City for a great touring pair. 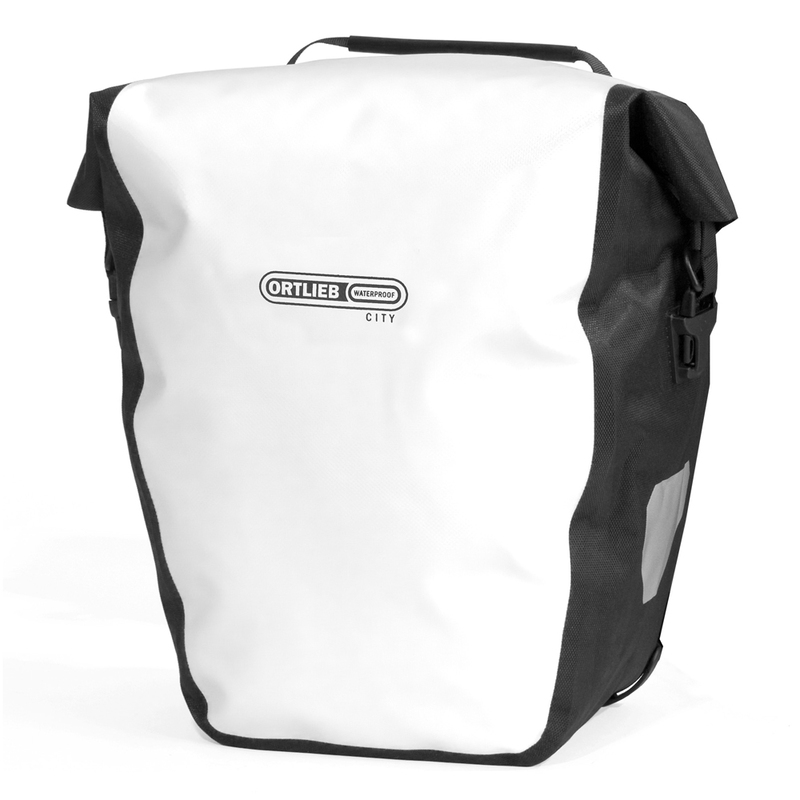 You can rely on Ortlieb bags to keep all of your gear safe and dry. 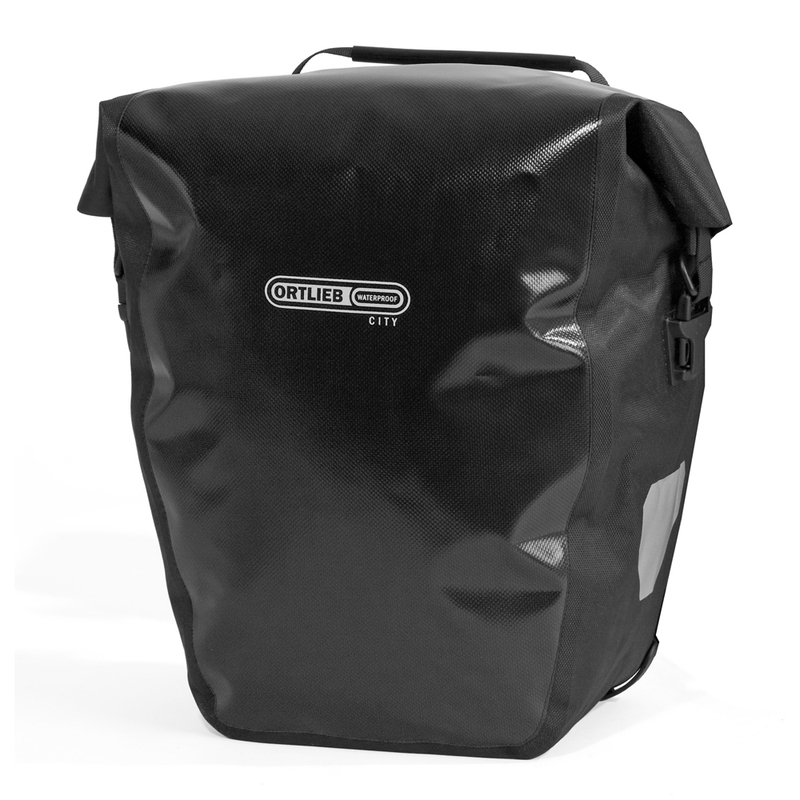 Universal pannier with roll closure; starter version; AL1 system for tack diameters up to 16mm; curved lower hook rail; PVC-coated polyester fabric; large reflectors. Includes two shoulder straps for carrying the panniers off of the bicycle. Highly reflective 3M Scotchlite patches on front and rear of pannier. I love these waterproof rear panniers. What I really like about Ortlieb panniers is that they come with adapters to properly fit your rack (comes really close anyway), you are able to get replacement parts as well. For weekend trips these rear panniers worked very well and carried everything I wanted them to. Very pleased with these bags and highly recommend them. I bought these to put on my Surly Straggler for San Francisco's Supermarket Street Sweep. I carried 49 pounds of food. No sweat. Now I'm thinking about getting a trailer from you so I can place next year. Great bags! Shoulder straps not included? Love these bags, I highly recommend them. I've been through many rain storms on my way to work and they work like a champ, look good too!